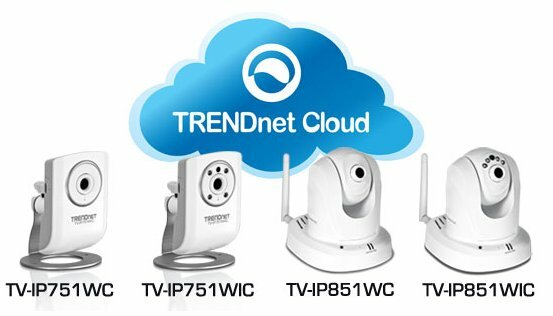 TRENDnet, a best-in-class wired and wireless networking hardware brand, today announces four new cloud Internet cameras. TRENDnet's regular Internet cameras are easy to install. Simply run the step-by-step installation CD to install the camera on a home or office network. Once camera installation is complete, the camera can be viewed within the home or office network. However, providing the ability to view the camera over the Internet requires additional complicated actions. Most Internet service providers constantly change your home IP address. If your home IP address is constantly changing, you will not be able to locate your home IP cameras over the Internet. To account for an ever changing IP address, users needed to sign up for a Dynamic DNS service, open ports on a router, create a virtual server rule in the router, and point the IP camera to the router. TRENDnet's Cloud IP Cameras remove all of these complicated steps by automatically finding your IP camera with a free and secure cloud service. TRENDnet Cloud IP Cameras install on a home network with a guided CD installation. Once the initial installation is complete, users simply open a web browser and input the unique web address assigned to the specific camera. Users will then be prompted to log into the cloud service and reset the username and password. Once logged in, users have full access to their camera's video and management functionality from any Internet connection. The cloud service is secure and free for all customers. For mobile devices, TRENDnet will offer a free mobile app on Apple's App Store. TV-IP751WC features include: a high speed wireless n connection; one-way audio; 640 x 480 (VGA) video at up to 20 frames per second (fps); a free mobile app; free industry leading software to manage up to 32 cameras; and a wall / ceiling mounting kit. TV-IP751WC Availability: Will be available from online and retail partners in September. TV-IP751WIC features include: night vision for distances of up to 7.5 meters (25 feet); a high speed wireless n connection; one-way audio; 640 x 480 (VGA) video at up to 20 frames per second (fps); a free mobile app; free industry leading software to manage up to 32 cameras; and a wall / ceiling mounting kit. TV-IP751WIC Availability: Will be available from online and retail partners in September. TV-IP851WC features include: remote 340° pan and 115° tilt functionality; a high speed wireless n connection; one-way audio; 640 x 480 (VGA) video at up to 20 frames per second (fps); a free mobile app; free industry leading software to manage up to 32 cameras; and a wall / ceiling mounting kit. TV-IP851WC Availability: Will be available from online and retail partners in September. TV-IP851WIC camera features include: night vision for distances of up to 7.5 meters (25 feet); remote 340° pan and 115° tilt functionality; a high speed wireless n connection; one-way audio; 640 x 480 (VGA) video at up to 20 frames per second (fps); free industry leading software to manage up to 32 cameras; and a wall / ceiling mounting kit. TV-IP851WIC Availability: Will be available from online and retail partners in September.